Benet Wilson writes that Chicago Rockford International Airport, an airport on Chicago’s far western fringe with limited commercial service, is going to partner with a charter airline (actually, a brand — Southern Skyways) to offer scheduled services to Denver and Detroit, the former to replace service United is withdrawing this summer. Rockford will control routes, destinations, and fares, and will eat the losses. As Benet points out, this is a bad idea. Regular airlines are struggling, and low-performing routes are getting cut. If Rockford can’t supply enough traffic to Denver when the route is a regional jet and has interline connections, how will it generate sufficient traffic with a larger plane and no connecting opportunities? Well, it will operate less frequently — a few times a week. Says the airport’s director: “You’ll see as many flights as you can fill.” That’s just the problem — there will be so few flights that being unable to fill them will become a self-fulfilling prophecy. Rockford says it’s doing this to prove what a good market it is to other airlines. Yes, it’s such a good market that United is leaving. The trouble with the fund-your-own-airline-service strategy is that Rockford is creating a different type of service than it’s trying to replace or recruit. It’s best to get connecting service to major hubs — the airport is already served to cheapo leisure markets by Allegiant. But the Southern Skyways service won’t resemble the connecting hub service the airport claims to need: the aircraft types and sizes, schedules, and traffic feeds will be completely different. Rockford’s taken a bad idea too far. There are better ways of recruiting airline service. We hold that requiring airlines to provide food, water, electricity, and restrooms to passengers during lengthy ground delays does relate to the service of an air carrier and therefore falls within the express terms of the ADA’s preemption provision. As a result, the substantive provisions of the PBR, codified at section 251-g(1) of the New York General Business Law, are preempted. . . .
Rowe accordingly forecloses New York’s argument and the district court’s conclusion, see Air Transp., 528 F. Supp. 2d at 67, that classifying the PBR as a health and safety regulation or a matter of basic human necessities somehow shields it from the preemptive force of § 41713(b)(1). Onboard amenities, regardless of whether they are luxuries or necessities, still relate to airline service and fall within the express terms of the preemption provision — a conclusion, we note, that even the drafters of the PBR appear to have been unable to escape. . . . Although the goals of the PBR are laudable and the circumstances motivating its enactment deplorable, only the federal government has the authority to enact such a law. Photo courtesy of Il Popolo della Liberta. Last week, Sean O’Neill addressed the tricky nature of measuring changes in airfares. Air fare indexes pick up or decreases in base fares over time, but they don’t pick up “nickel and diming” (the addition of lots of charges for luggage, food, over-the-phone booking) or declines in service (cranky flight attendants, less legroom). I’m on record as being in favor of price transparency. The regulation-era model of aviation ticketing assumed a monolithic travel market, like a Soviet-style clothing factory — one size fits all. There were few limitations on the ticket, a meal and a drink onboard, and room in the hold for three suitcases. Pre-deregulation experiments like the loosening of the Florida market demonstrated that the market is diverse. Some people are flying somewhere for a year and need all the luggage they can tow; others are flying for a weekend and are fine with a carry-on. Some people get very hungry in-flight; others eat beforehand. Some people may need to make changes at the last minute; others plan their schedules around their flights. One of the reasons average airfares went down by almost 40 percent in real terms from 1980 to 2005 was exactly that the cheapest tickets offered during this time were less flexible and included fewer amenities. Unbundling ancillary services from the basic cost of travel, many airlines have made it possible for low- and middle-income people to enjoy unprecedented access to air travel. You get what you pay for. Sean neglects to mention service improvements over time, especially in routing. Deregulation freed airlines from their patchwork routes, and the carriers organized themselves around hubs, collecting feeder traffic to national and international networks. Today, almost every airport in the country is only one stop away from almost every other airport in the country and from many major markets in Europe, Asia, and Latin America. Compare that to the convoluted route maps in the Airchive. Increased transparency in air travel pricing is nothing to mourn. Moreover, one would be hard-pressed to argue that in the past thirty years, ancillary fees have gone up enough to compete with the inflation-adjusted reduction in average fares. Photo credit: Flickr user alex-s. Used through a Creative Commons license. Search parameter of the day! Today someone arrived at my blog via the translated-into-Spanish version. El política de aviación blog habla Espanol. Also, apparently my Spanish surname is Chispas. I subscribe to the Daily Airline Filings feed (can’t link to the post; the site is password protected but the feed is not), and an interesting item came through today. 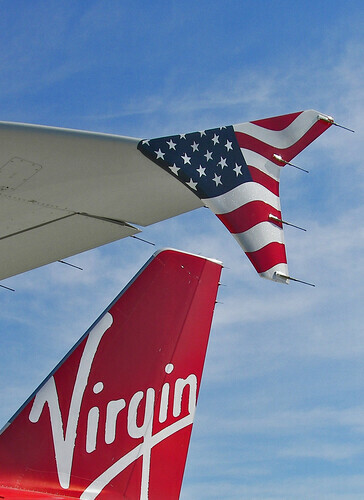 Virgin America has filed for confidentiality for its Form 41 filings of operations, traffic, and financial data with the Department of Transportation. Why? Public release . . . would cause Virgin America to suffer substantial competitive harm because the local nature of traffic in its point-to-point markets and the limited number of aircraft types operated will permit Virgin America’s competitors to: (1) obtain commercially sensitive competitive infonnation on Virgin America’s service in these markets; and (2) accurately calculate a variety of market-specific information, including cost per available seat mile, yield, revenue per available seat mile and profit margins. But other airlines have to release this data, right? New airlines often seek to keep this information private while they’re establishing themselves. If JetBlue or United sees that Virgin America is doing well on a particular route, they can dive in with bargain fares and try to drive the upstart competitor out of a particular route. Virgin America claims that it will still be supporting the department’s intent of maintaining detailed data on airlines, but it won’t be providing its competitive edge free to other airlines. (For once,) I don’t have a strong opinion on this issue. Feel free to sound off in the comments with pros and cons of requiring start-up airlines to release these data. Does it give the newbies a competitive edge over the entrenched carriers, or vice versa? Should anyone’s traffic data be released, or is that proprietary? Let me know what you think. Very cool photo credit: Flickr user Kaptain Krispy Kreme. Used through a Creative Commons license. BREAKING NEWS: Delta and Northwest’s pilot groups were unable to come to agreement about a merged seniority list. Delta MEC chairman Lee Moak announced the breakdown of negotiations today in a letter to Delta pilots. Without a merged seniority list, a merger might still go through (companies can force master seniority list mergers, as I’ve written before), but moving forward without agreements from labor means the merged airline’s management has to spend time, money, and energy on important operational issues that might have been resolved up front, like US Airways has been doing for the past two years. What does this mean for industry consolidation? Mergers are probably off. It was reported that United-Continental was ready to move forward as soon as Delta-Northwest was announced (due to Northwest’s golden share in Continental), but that combination will now be scuttled. In the end, I fear that the merger mania was really a plan to goose stock prices, not actually create value. The hyped capacity cuts are coming anyway, thanks to airlines needing to shed planes and routes that don’t make money at $110/barrel oil (see Mike Boyd’s current weekly commentary). With capacity cuts coming to an already-trim industry, I don’t see the added value of mergers anymore. RIP, Merger Mania 2008. Hat-tip to Things with Wings, where I first caught this story. After the jump, choice excerpts of the letter.